Who are ya gonna call? Armed with video cameras, tape recorders and Tracey Dunn's seven-layer dip, several ghost hunters head to the dimly lighted basement of a century-old Ogden building in the wee hours of a Sunday morning. Earlier, the abandoned farm-warehouse-turned-spook-alley was a screaming house of horrors. It is silent now. The actors painted with ghoulish makeup and splattered with fake blood are gone. But the real spirits of Dead Haven � a wandering man, a moaning woman and perhaps a young girl � remain. 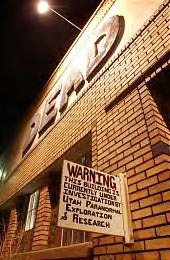 Members of Utah Paranormal Exploration and Research are here looking to get acquainted with them. "I don't doubt there will be some activity," said team leader Merry Jane Barrentine, who works at the McKay-Dee Hospital. "It's easier to digest if you actually experience it for yourself." Run-ins with the supernatural have been reported throughout Utah. Dozens of places, including the Capitol Theatre and Rio Grande Depot, are said to be haunted. Train stations apparently are good places to meet ghosts. The Utah State Historical Society has a file of reported sightings of the "Purple Lady" in the old Rio Grande station in which the society is housed. According to legend, a raven-haired young woman in a purple velvet dress met her soldier fiance on the platform during the first or second world war. They argued and he threw her engagement ring on the tracks. A train hit and killed her as she tried to retrieve it. The jilted spirit hasn't been seen lately, at least "not that I recognized," said Kent Powell, state history director. Barrentine says hospitals, theaters and schools are likely ghost haunts. "If you're a young person and you pass away, where would you want to hang out, a school or a cemetery?" Everyone knows the Capitol Theatre is haunted. Retired stage manager Doug Morgan spins numerous yarns about lights going off and on, doors locking and unlocking and a large stage rope in full swing � all while the building was supposedly empty. He came to attribute the happenings to a mischievous ghost he named George. Barrentine said she first tries to show an event isn't unusual. "We try to prove that it's naturally occurring. If it's not naturally occurring, then we do have something." At Dead Haven, the ghost hunters � they prefer to be called paranormal investigators � probe dark corridors and rooms decorated as grisly torture chambers. They shoot video hoping to capture spheres of light called orbs and record EVP, neither of which the naked eye or ear can detect but have ghostly implications when discovered on tape. On one eerie recording, a tinny voice asks, "Who's there?" Orbs' movements, she says, are graceful. They're playful and sometimes respond to human voices. "They show signs of intelligence," she said. This one might only be a speck of dust in the air. Moments later, another flash of light seemingly snaking through the wall appears in the viewfinder. "That could be what we call a squiggly," Barrentine says. In other words, more evidence of something paranormal. Or maybe just be a moth. "We'll just have to take it frame by frame." Ghost hunting is tiring and tedious work. After staying out all night, there are hours of video and audio tape to review. Deciphering the shadowy images and garbled sound is where much of the hunting occurs. Others signs of unusual activity are scant this night, so Barrentine takes a new tack. She gathers the team in the Dead Haven graveyard to do "some serious talking." "My name is Merry. Will you please join us? The other night you turned the lights on. Could you turn the lights off or even turn the music on? I would really like to be able to communicate with you. Would please join us in the cemetery? I want to learn about the little girl. Is there actually a little girl in here?" Ghost chat with Merry Barrentine didn't bring out anyone from the darkness. The team eventually retires to a parlor area in the haunted house for chips and Dunn's homemade dip, cold pizza and other goodies. Small talk, of course, turns into a series of ghost stories, the kind you don't want to hear before leaving, especially when Barrentine says ghosts sometimes follow people home. Warren Braegger, the spook alley owner, relates a tale about the night he drove the company van home from Dead Haven. None of the dials on the dashboard nor the turn signals worked. Though skeptical, he decided to heed Barrentine's advice to politely ask the unseen passenger to leave. Braegger says everything came up immediately, as did the hair on the back of his neck. What they would really like is another glimpse of what they believe was the shoulder and arm of a man they videotaped on one of many previous visits the past year. But there are no apparitions or anomalies in the first hour or so this night, unless you count the not one but three flashlights that suddenly won't work. "They're playing with us tonight," says Dunn, who also works at the McKay-Dee. While team members fumble around for spare batteries and a light bulb, building owner Warren Braegger quips, "How many paranormal investigators does it take to change a light bulb?" These folks take their hobby seriously. They don't bumble around like the Scooby Doo gang looking to unmask an imposter. Barrentine gasps about 2:30 a.m. She has spotted what might be an orb through the lens of her Sony camcorder. She rewinds and reviews the bobbing light ball over and over.